I remember this story from grade school. 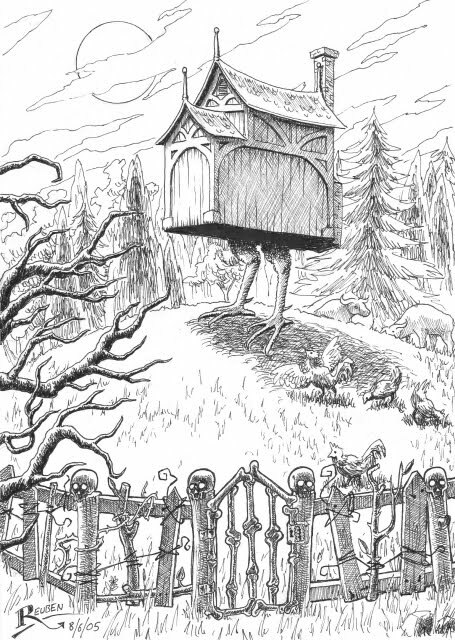 I was reading every traditional fairy tale I could get my hands on and just obsessed over Baba Yaga; the Russian witch with her house that ran around on chicken legs. Or at least ran behind Baba Yaga who was intent on chasing children through the forest to eat them. She didn't ride a broom but a mortar and pestle...how can a twelve year old not love this? Anyways, I have just been running an idea of Baba Yaga's chicken house through my head...walking quietly through a dark gloomy forest. Pecking at small insects and generally just being your normal, everyday chicken house.